All local hotspots are based on cookies and available only from this browser. Want to participate to the growth of the predefined set of hotspots? Are you sure you do? Found an issue or simply have a question? Want to participate to the growth of the predefined set of shapes and hotspots? The Timeline is used to show the layers of data related to the selected date. To do this, you can move the sliders, setting the desired day. You can also see the time variations by running the animation. When there's too much datasets (more than 100 by default), they get split into pages (of size 100 by default). The number of currently displayed datasets is shown between the two buttons. You can use the left and right buttons to change the displayed page. You can also use the hotkeys SHIFT+B and SHIFT+N. You can click on the displayed count to show this message again. On the Products panel you can choose the products to show as layers on the map. There are several ways to scale the desired region on the Map. To move around the map you can just drag it by mouse. The Toolbar provides additional features for interaction with the service. 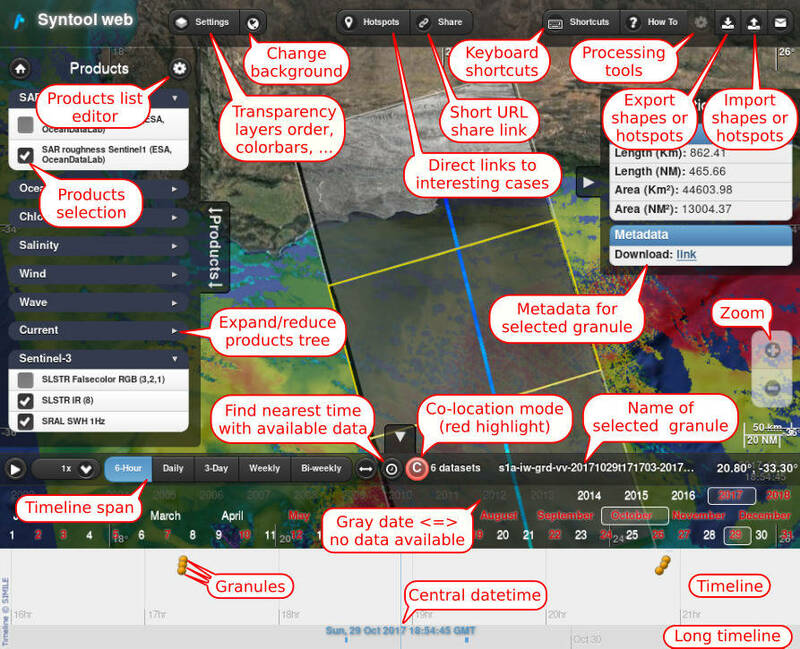 Products: manage the visibility of layers and datasets. Hotspots: manage bookmarked application states. Share: allows you to get a short url for the current region. Settings: choice of display theme, region, etc. The Ocean Virtual Laboratory tutorial is finished! All the tools can be used in any order. Now you can continue to explore by yourself!